A motorist was texting when she hit two girls walking to a McDonald’s restaurant in Tierrasanta, killing one of them, a prosecutor said Monday, but a defense attorney said her client fell asleep at the wheel and was unaware of what happened to the youngsters until she returned to the scene with her father. 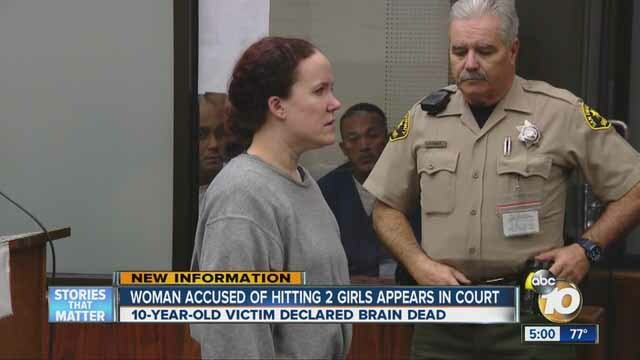 Julianne Little, 31, is charged with gross vehicular manslaughter and hit-and-run with injury in the February death of 10-year-old Raquel Rosete. Deputy District Attorney Melissa Vasel told a jury that Little was talking on her cell phone and sent a text message to a friend just before 6 p.m. on Feb. 20. Navy Capt. Brian Shipman testified that he was driving north on Santo Road near Shields Street when he saw bobbing headlights in his rear-view mirror and a car re-entering the roadway from the sidewalk. Shipman said Little pulled up next to his car at a stop light and he got behind her and jotted down her license plate number. “I knew something bad had probably happened,” Shipman testified. He said he went to a shopping to pick up dinner, but immediately turned around and drove back to where he saw Little’s car leave the roadway. Shipman said he saw a runner, Amanda Procter, tending to a 12-year-old girl named Mekayla and gave a 911 operator a description of Little’s Toyota Corolla. Mekayla suffered a broken ankle and spent two days in a hospital. She testified that she doesn’t remember what happened that night. Raquel was discovered 48 feet away by another passing motorist. The child — who suffered a broken spine and a traumatic brain injury — was placed on life support and died three days later. Vasel told the jury that Little didn’t call for help and drove off, leaving the girls to die. Defense attorney Anna Yum told the panel that Little dozed off at the wheel and didn’t know that she hit the girls until she returned to the scene. Yum said Little’s car hit the curb and ran up onto the sidewalk, causing her to hit her head, then ended up back on the road. Little drove 1.7 miles to her home and told her father that she was in an accident and they went back to the crash scene, where Little told officers what happened, Yum said. The defendant cooperated with police and voluntarily submitted to a blood test, which turned up negative for alcohol and drugs, Yum told the jury. Yum said Little was tired from working and was on the phone with her mother for eight minutes until 5:47 p.m.
At 5:56 p.m. Little sent a text message to a male friend that read, “I’m going to miss you my friend,” according to Yum. The defendant was scheduled to go on vacation the next day, her attorney told the jury. Yum said Vasel wouldn’t be able to prove the case beyond a reasonable doubt and asked jurors to acquit her client. Little faces up to 11 years and eight months in state prison if convicted.